CSCPF was established in 2014. Our approach to governance reflects our values. Because we value inclusivity, accessibility, transparency, and ensuring that all voices have a chance to be heard, we have had to do the creative governance work necessary to make this a reality. 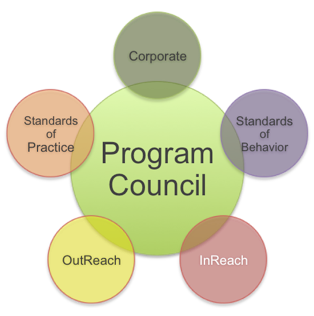 As we work to establish a participant-based organization, we are also working to balance the authority of our Fiduciary Council with the equally important Program Council. And because both of these are elected by or come from our Individual Member participants, all three components share in governance. 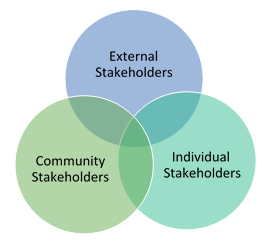 many external stakeholders outside of CSCPF itself. 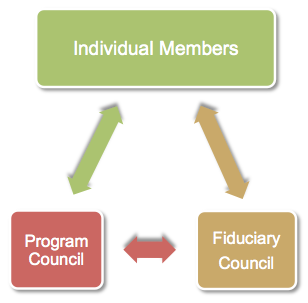 The Fiduciary Council is the legal Board of Directors of CSCPF. The Fiduciary Council is responsible for the legal, financial, and corporate aspects of CSCPF as a 501(c)(3) not for profit organization. According to our Bylaws, the Fiduciary Council is elected for two-year terms by all of the Individual Members of CSCPF. Elections are held in September. The Fiduciary Council then elects the Officers of CSCPF.